Some people dream of living by the sea, some people long to see nothing but miles and miles of rolling hills from their kitchen window and some people like to see and hear life on their door step. I’m more like the later but when it comes to getting away from it all, the sun-drenched desert landscape and the enormity of jagged, Jenga style mountains adorned with exotic plants and flowers that exist in complete stillness and peace, is my favourite escape haven. My husband Alex and I have been fortunate enough to travel around California a handful of times, visiting the Mecca of Modernism Palm Springs, hippie-hideouts in Topanga Canyon and hilltop ranches in sporadic small towns residing on the edge of gigantic national parks. In fact we love it so much we’re heading back in January to explore the infamous Death Valley that boarders California and Nevada and heading south to the equally infamous Joshua Tree ! We always come away so inspired from this truly special part of the world, we’ve decided to welcome a little bit of desert inspired decor into our own home, starting with a new renovation project in our living room. What I really like about the desert look is that it is the perfect bridge between more feminine bohemian styles, mid-century modern and jungle decor. 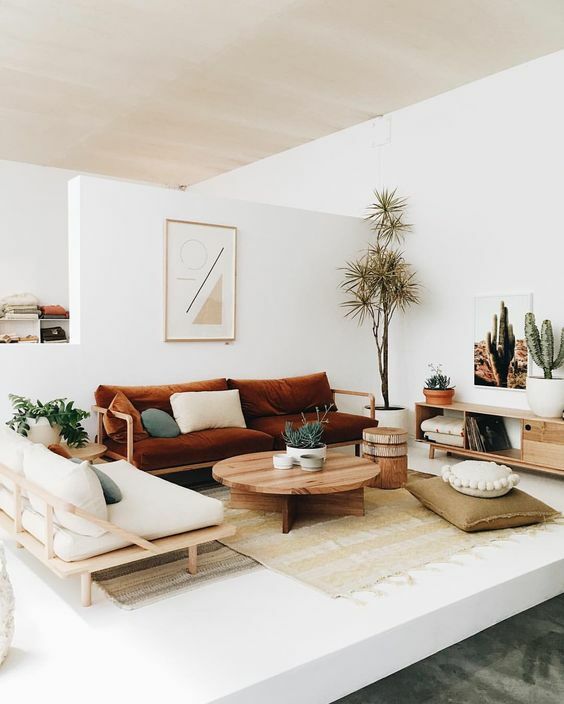 I like the effortless, lived-in environment that desert inspired homes radiate and below I’m going to be talking through how we plan to introduce these design elements into our lounge and how you might take inspiration to do so into your own homes. Many desert homes are painted predominately white, probably due to the large open spaces and windows. In contrast, we are planning to use a bright, light-reflecting off white for one wall and are the painting the remaining 3 walls in warm, light terracotta with a chalky finish such as Book Room Red or Red Earth both by by Farrow & Ball. On the whole a neutral colour palette of nudes, beige, off-white, cream, coffee, terracotta, caramel can be made interesting and exciting through the use of texture, levels and arrangement. Wood is perhaps the strongest design aspect of the desert decor trend. Be it entire wooden rooms seen in cladded cabins or incorporating various types of wood in one space such as fixtures and fittings like cupboards and built in shelves, mid-century furniture and reclaimed flooring. Our existing floor is a dark walnut parquet was only laid 18 months ago and now is finally showing some lovely worn-in marks and grooves, perfectly in-keeping with laid back desert decor. Traditional Native blankets are a popular decorative features in many desert homes, such as Pendelton. They look stylish draped over sofas or rolled and displayed in baskets. However they can also be displayed walls by sewing loop holes to each corner and using large, industrial pins or clips to attach. For a softer look try a large piece of fabric art like the botanical scarf featured below. Introducing handwoven wall art crafted from yarns and wool or embroidered tapestry is another good option to create texture. 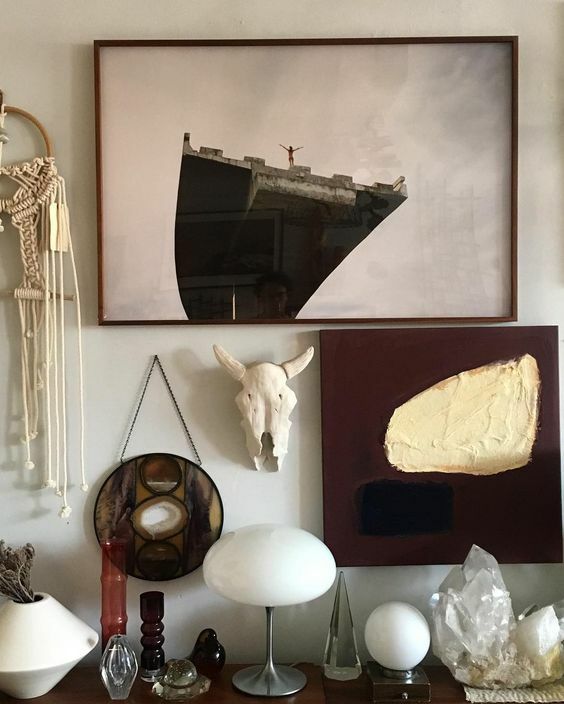 We’re planning on creating a curiosity wall that features personal souvenirs from our travels to the dessert like postcards and photographs that will sit alongside vintage wall baskets similar to the ones below. Wicker, bamboo, rattan, driftwood and birch ply as are common furniture choices within desert homes. They work well together as they are usually quite light in colour and tone. I personally like the idea of introducing a tiki vibe to a desert inspired space by displaying a 70’s rattan bar cart with vintage glassware and beautifully branded liquor bottles on show. Bamboo basket lighting displayed as a statement centre room feature or various shaped and sized grouped together and arranged at different heights looks really striking. We are in the middle of sourcing a vintage sofa with an exposed wooden frame, preferably with a super soft buttery yellow leather seat and cushions to help with our ever-hair-shedding pets ! Below are some beautiful exposed frame sofas, the velvet rust is my absolute dream sofa in an ideal world ! Most people assume that California lifestyle as being largely associated with glitz and glamour and whilst this is true, another big lifestyle influence is Bohemia, nature and spirituality. In addition to using native patterns within rugs, cushions and tapestry, moon-phases crafted from glass are an interesting alternative piece of wall art for your desert inspired room. Objects like crystals, minerals and fossils as well as mood creators like smudge sticks and incense burners also add nicely to the spiritual detail. Add finer desert detail with handmade pottery such as vases, votives and pots in various shapes and textures. Look out for large bulb-bottom ceramics or large urns that look great displayed on the floor next to huge house plants. Another nice idea is to source pottery that is inspired by the landscape. We picked up some incredible handcrafted bowls and mugs by Santa Cruz potter Coco Chipsa, who’s work is inspired by Calforina’s moutnains, oceans and deserts. Tiles are a really good way of bringing some colour into a neutral space. If you’re going for more of an Americana influenced look, vintage tin tiles work really well as splash backs in a kitchen or if you’re feeling really experimental as a tinned ceiling ! In our living room we are hoping to use ceramic diagonal colour block tiles (similar to the ones below) in either burnt orange and white or mustard and white to tile half way our main white feature wall, where our long-standing teak sideboard will sit in front with large house plants arranged either side. Bringing the outside is a key design element to creating a desert inspired room. Dry-heat, vibrant green plants such as various cacti, snake (mother-in-laws tongue), donkey tails and air plants look great grouped together or displayed singularly as one large statement feature plant. Dried flowers pressed into frames or hung upside-down, will work well as part of a shelving display or curiosity wall if you’re looking to shape a more bohemian look. All images in this blog post are not owned by Object Style and have been linked back to the source. Click on the image for the original source reference. To see more Decor Decor inspiration follow my desert board on Pinterest. Look out for our NEW desert design range coming soon to our store.